BRANDON, Man. – Gervan Fearon will move on from Brandon this summer to become Brock University’s next President and Vice-Chancellor. 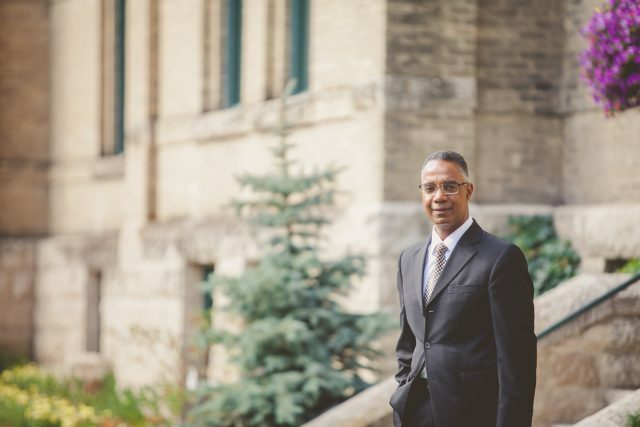 Brandon University wishes President Fearon all the best and thanks him for his years of collaborative and innovative leadership as President and Vice-Chancellor at Brandon. He leaves behind a legacy of community-building, insight and collective vision, embodied in a new Brandon University Academic Plan and a forthcoming Brandon University Campus Master Plan, and new positions devoted to Sexualized Violence Prevention and to Diversity and Human Rights. Fearon, who has spent numerous years in senior leadership roles at Canadian universities, commences his new duties at Brock on August 1. In the meantime, Fearon will continue to serve as President at Brandon University. The appointment, announced today by John Suk, the Chair of Brock University’s Board of Trustees, caps an intense eight-month recruitment process that involved several leading candidates from across Canada. Fearon received his Ph.D. in Economics from the University of Western Ontario, after having received his master’s and bachelor’s degrees in Agricultural Economics at the University of Guelph. He also holds a Chartered Professional Accountant (CPA, CGA) designation. Besides academic achievements, his career also includes several years in the Ontario Government as a senior analyst at Treasury Board Division, Ontario Ministry of Finance, and as an executive assistant to the Deputy Minister at the Ministry of Agriculture, Food and Rural Affairs. He has also served on numerous community, university and governmental boards as well as being a recipient of the Queen Elizabeth II Diamond Jubilee Medal. After arriving at Brandon in 2013 to serve as Provost and Vice-President Academic, he was appointed President a year later. He focused on developing a shared vision for advancing the university’s development as well as its engagement with the surrounding community, an emphasis he plans to continue in his new role. “I look forward to engaging with students, faculty and staff at Brock and working as part of a team on the priorities of the University and community. Brock is well-known as a comprehensive university with outstanding experiential education, student-engaged academic programs, and innovative research and creative activities,” he said. Fearon says his community and partnership-building experience in Brandon provides a good foundation for his future role at Brock. Prior to becoming the President and Vice-President (Academic) at Brandon University, Fearon served at several academic positions including as the Dean of the G. Raymond Chang School of Continuing Education at Ryerson University, the largest school of adult education in Canada, and as an Associate Dean at York University’s Atkinson Faculty of Liberal & Professional Studies, as a Visiting Scholar at the University of Washington, and as Associate Professor at York University. As Brandon’s president, Fearon worked with faculty and administration at the university and at Assiniboine Community College to develop a Memorandum of Understanding that has deepened the links between Brandon’s two post-secondary institutions, with options for faculty and staff that include professional development, new courses of study, research opportunities and increased student mobility. He has also worked at advancing student engagement, teaching excellence, research activities and internationalization at the university. He also engaged Brandon students, faculty, staff, alumni and community members through an extensive consultation process to develop a new academic plan that supports teaching, learning, research and university-community engagement until 2020. Following today’s announcement, Fearon expressed thanks to students, faculty and staff as well as the Board of Governors and the Brandon University Student Union for their support in strengthening the university’s enrolments, academic programs and services, research and creative activities, and community engagement. “My many colleagues at Brandon University and friends in Brandon and in Manitoba offered generous support and thoughtful suggestions, and helped strengthen the University and enhance its community engagement,” he said, adding that Brandon has been a wonderful and welcoming community for him and Dr. Kathy Moscou. Brock’s Board Chair Suk said the University and the broader Niagara community should be very well served by the incoming President. “Dr. Fearon brings excellent qualifications experience and strong leadership to Brock at an important time in its development,” Suk said. Brock’s presidential search committee was headed up by trustee Gary Comerford, who later this month will succeed Suk as Board Chair. Fearon will continue as President of Brandon University, assisting in the transition over the next two months, until he begins his term at Brock on August 1. Brandon University, founded in 1899, promotes excellence in teaching, research, and scholarship, and educates students so that they can make a meaningful difference as engaged citizens and leaders. Brock is a comprehensive university located in the Niagara region of southern Ontario. With 19,000 undergraduate and graduate students, Brock is known for diverse signature programs from health sciences and accounting to sport management, lifespan studies and environmental sustainability research. Dr. Gervan Fearon’s tenure as President and Vice-Chancellor at Brandon University has been one of collaboration, consensus-building and teamwork, focused on developing a shared vision for advancing the University’s growth and development as well as its engagement with the community across the region. Prior to his term as President, Dr. Fearon joined Brandon University as Vice-President (Academic and Provost) in 2013. While in that position, he engaged with students, faculty, staff, alumni and community members through an extensive consultation process to develop a new Brandon University Academic Plan to support teaching, learning, research, scholarly and creative activities, and university-community engagement through to 2020. The Academic Plan has served as the framework document for the development of faculty academic and unit strategic plans and has proved the basis for growth in undergraduate and graduate enrolment and for growth in research funding at the University over the past four years. Dr. Fearon has helped foster deeper links between Brandon University and Indigenous communities, serving as a longstanding member of the Brandon Urban Aboriginal Peoples’ Council. Additionally, as a member of the Council of Presidents of Universities of Manitoba (COPUM), Brandon University established a Blueprint for Indigenous Education that now forms the basis for advancing Indigenous Education at Brandon University through a Senate Committee, including direct reference to the TRC Calls to Action. One of Dr. Fearon’s early acts as President was to work with faculty and administration at both Brandon University and Assiniboine Community College to develop and sign a comprehensive Memorandum of Understanding between the two institutions. The MOU has deepened the links between Brandon’s two post-secondary institutions, with options for faculty and staff that include professional development, new courses of study, research opportunities and increased student mobility. International cooperation has also been a priority. Working with Brandon University’s Office of International Activities, Dr. Fearon has supported efforts to internationalize both the student body and the faculty at Brandon University, signing numerous international agreements from China to the Caribbean. Faculty engagement has been key to many of the accomplishments through Dr. Fearon’s time at Brandon University. The latest four-year collective agreement with the Brandon University Faculty Association was achieved in record time and earned the support of 95 per cent of BUFA members. That has allowed Dr. Fearon, in collaboration with the Vice-President (Finance), to consistently balance the budget while investing in priority areas. Last year, Dr. Fearon initiated Brandon University’s efforts to fully revamp its response to and policies on sexualized violence, directing the hiring of a new position responsible for coordinating sexualized violence education and prevention, and overseeing a broad university-community consultation process led by the Vice-President Academic. The consultation process involved students, faculty and staff, Brandon University Students’ Union, Brandon University’s Human Rights Officer, and Human Resources as well as external experts in the development of a new stand-alone Sexualized Violence Policy based on best-practices that aligned with the newly established provincial legislation. This new policy is survivor-centred, gender-inclusive and trauma-informed and aims aimed at educating and shifting attitudes as well as taking action to address and prevent sexualized violence. Other priority areas at Brandon University have also received new investment, including through the hiring of a Diversity and Human Rights Advisor, an Institutional Data & Analysis Unit, a position for an Associate Vice-President (Teaching and Learning), and a Co-operative and Experiential Education Coordinator. Dr. Fearon has led by example in community relations, connecting both personally and professionally with the wider public of Brandon and its region. Recently, Dr. Fearon has engaged with faculty, students, staff and the wider community on an ambitious downtown Brandon campus expansion as well as a comprehensive Campus Master Plan. The strengthening of University-community relations have led to the City of Brandon and Renaissance Brandon transferring property and to Landmark Cinemas donating the former Strand Theatre to the University for the transformative downtown student and seniors residence complex with commercial and academic space that is being planned. Dr. Fearon has also supported the continued successful programs that Brandon University offers in the city of Winnipeg, and has further offered support to a pilot project with the city of Dauphin to offer first-year university programming in that city. Dr. Fearon encouraged the on-going development of the Centre for Teaching, Learning and Technology and created the Institutional Data & Analysis Unit at Brandon University. Working with the Institutional Data & Analysis Unit, Dr. Fearon has initiated the development of a strategic enrolment management plan for supporting the growth and long-term sustainability of the University. Dr. Fearon holds a Ph.D. in Economics from the University of Western Ontario, and degrees in Agricultural Economics from the University of Guelph. He has a Chartered Professional Accountant designation and recently completed the Institute of Corporate Directors program through the Rotman School of Management at the University of Toronto. He served as a Dean at Ryerson University in Toronto, Associate Dean at York University, Visiting Scholar at the University of Washington, Senior Analyst at the Ontario Ministry of Finance (Treasury Board), and Executive Assistant to the Deputy Minister at the Ontario Ministry of Agriculture, Food and Rural Affairs. A well-published scholar, he is also the recipient of awards for teaching excellence and the Queen Elizabeth II Diamond Jubilee Medal.